Last edited by JC; May 7, 2011 at 06:54:00 AM. That is a cool house. I wish you wouldn't have killed the sheep. Gonna post my town when I feel like taking pics. Dayum, that's a big monitor! But you know what would make that look better? Last edited by Ningamer; May 11, 2011 at 10:33:39 PM. BTW, nice wooded area Nin. Last edited by JC; May 12, 2011 at 09:29:39 AM. We had quite a bit of fun on PvPplus...until we both lost a duel. Last edited by Ningamer; December 16, 2011 at 07:24:08 AM. I have completed my path to my house, and it's a long, long, long path to walk. Railways are coming. This is in the sever, near the tall tower in the village, just climb up this hill, and you see a long path. ...Yes, I know I've posted this before, but it'll get more attention here. Don't mind me, just forever gone while wasting away elsewhere. Last edited by Kero; June 26, 2012 at 02:46:55 AM. Almost too large for extreme render distance w/ Optifine! Last edited by Cat333Pokémon; August 16, 2012 at 10:10:52 PM. This is our little mini castle. It was originally just a really small house made out of every material ever, since the wood we used was always getting burned. Those stairs lead to our underground rooms. This is pretty much the "top floor" of our underground houses, but the bottom floor is scattered with obsidian and the floors messed up, so I'm not going down there. This used to be a quarry leading down to a slime farm, but I made the mistake of letting my friends use TNT. This is what we built yesterday. A Nether house for the portal, but the Nether is all broken in here, so we go through that portal and come out from a different one underground. And then there's a church me and my friend made. It's the GOLF **** church full of swag. And that bridge leads to my new cliff house. You can also see the towers on the castle, too. I made this a couple weeks ago when I was bored. I liked the idea of building things out of sand/sandstone, so this is what I made. It took way too much sand though. Thank god my world is practically all desert. Here's some more TNT destruction with my fail tree farm and my friends floating sugar cane farm. Have you ever seen terrain this wacky? Found this while browsing around. I thought it looked a bit familiar. The rock borders on the water tipped me off to something like that. The amazing floating glitchy grass! My big sheep pen with white, cyan, and blue colored sheep. Just outside of my underwater house. 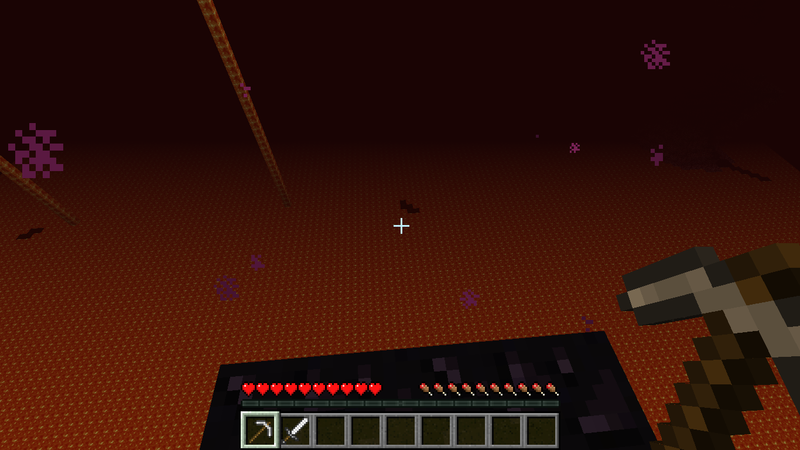 You can see the nether portal on the right side. This was on the old VR server. A creeper got into my chicken pen. Hmm...yep, I've never seen this crazy guy in my life. It is raining on the old VR server! Oh, and I remember lightning making a fire spot on the ground where it hit. I don't remember why I took this picture, I think I accidentally clicked F2. I suppose I should add a few of my own. Head towards the light! It's the light from a beacon while looking straight down into it. The nether using a customized Painterly Pack. Looks a lot more netherly to me. My first ever house on the first ever world I played on Minecraft. It's not much, but often times the cool stuff is behind the door. Picture time. The first one is a picture I took a long time ago, but the other three I took today on my single player world. Yes, I know I'm in creative, but you can't place ladders on air, even in creative mode. In case you're wondering, ladders are transparent if you look at them from behind. 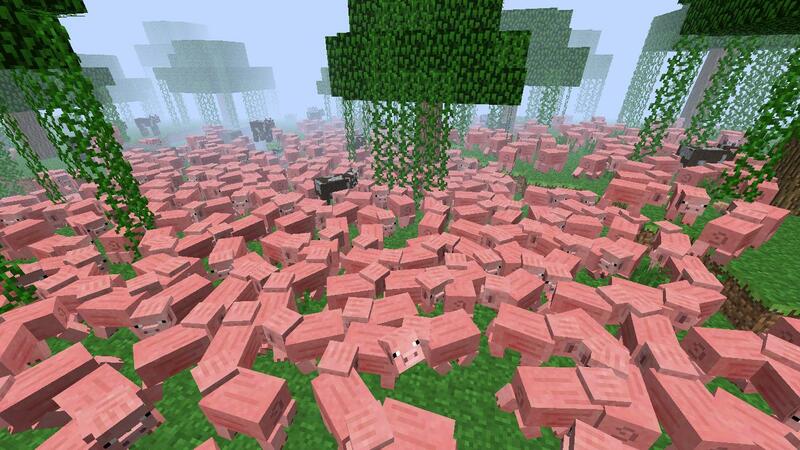 A pink sheep that spawned naturally. I've never seen that happen before. I decided to do something different than I ever have before. Instead of building a house or digging one in the ground, I decided to place everything on the ground and call it my living area. I actually made two rivers to make it an island and lit up the entire place and even cut down all the trees on the island (I currently have nearly two stacks of Oak Saplings). I'm still working on it, however. I plan on filling in that small pond right next to my animals and then expanding the fence area and surrounding the entire island with sugar cane. The sugar cane is very noticeable from afar, especially at night when everything on the island is lit up, which helps me find my way home when I explore (which I had to do when finding pumpkins. Ended up getting lost for a day and only found one pumpkin). I've terraformed the land quite a few times, adding dirt to the edges to make it slightly larger so I have more room. I've also flattened it out a bit. Also, if you're wondering, there's nothing in that witch hut - never was. I saw the hut when I started the world, but I forgot I was on Peaceful when I started the world. And yes, that is a Creeper blasted hole near my bed and fenced area. I'm keeping it there. 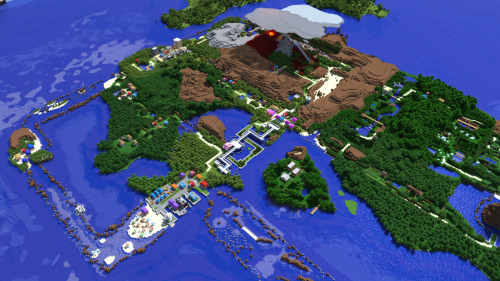 What does Minecraft look like stretched across two 1920X1080 Monitors? Like this! I think all of these pictures should be self-explanatory, including the totems. Edit: Added a self-dispensing chicken oven. Last edited by Cat333Pokémon; December 5, 2012 at 12:31:14 PM. When you see it.... ʳᵘᶰ. I don't play Minecraft very often but sometimes I hang with Hinoarashi, Glitchy_Furrystuff, and PokeRemixStudio on a server. Here's something I made in the server we play in. I use the JohnSmith pack because it's the only texture pack that doesn't look like garbage. I had a little too much fun with the superflat presets. I need to take pictures more often, but I have these so far. Hmm...I swear I know this guy. Anyway, Cat and I played together recently. Oh, and I'm surprised I could use the minimap on the VR server; I thought it wouldn't work. Cat had fun playing with a skeleton. Nice arrow in your head, bro. 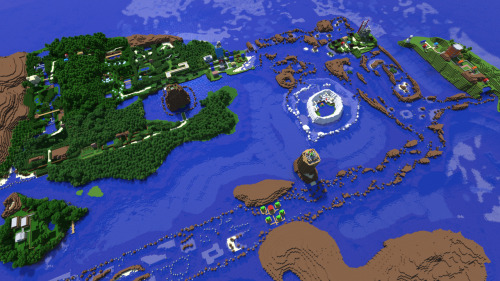 You're allowed to use it for basic features like as an actual map and to set waypoints, but most of the ore location features and other cheats are disabled on servers (unless the server sends a special command to enable them). Needs more arrows, and a flat TNT world. Last edited by Cat333Pokémon; February 28, 2013 at 01:56:21 PM. All I can say to those is this. I found an abandoned mine shaft at bedrock. I had quite a bit of fun creating a farm. And a free picture of taking a few arrows to more than just the knee, too. Scary fact: that pickaxe is still at about ¾ after doing a bit of strip mining thanks to Unbreaking III. Couple pieces of weirdness from my last few months. I like chickens. Last edited by Dragonite; April 25, 2014 at 11:51:53 AM. ...Has anyone managed to actually find a stronghold while not looking for one? I was just trying to expand my map when I found this bit sticking out underwater. The third image has had its brightness, contrast, and blue saturation adjusted for clarity. EDIT: Not just any room...but the End Portal room itself! EDIT 2: And it is ONLY the End Portal room, and it's suspended above the ground... What the heck? Last edited by Cat333Pokémon; April 25, 2014 at 05:27:56 PM. Wish I could find an end portal room . . . also, I remember hearing a long time ago about a seed that created a similar dungeon in the middle of the water and not attached to anything. Was quite a few versions ago, though. I believe these two images should speak for themselves. Been having a little bit of fun with the new World Customization things. Some people might see this as cheating, but I do like to build stuff with redstone and minecart rails and iron without having to go cave diving for a week but a the same time I don't like being trapped in the Creative Mode immortality. A couple of pictures from a Pixelmon server I staff. The first one is me and my Shiny Salemence. The second one is from when we were having fun with the /effect command, and the third one is when I somehow challenged myself to a battle. Last edited by isbragg; March 30, 2015 at 10:39:31 AM. I haven't played Minecraft in a couple months, but I feel like sharing a few recent screenshots. I played a little bit recently with Reuniclus, and this represents the closest I have ever gotten to completing the achievements. We actually completed a full beacon. In addition, it's a pain to make the 1-kilometer mine track. I tend to only go after that when I've punched a long tunnel in a cave for strip mining purposes already. This is an interesting place for a Nether portal. Quite a small mushroom island I've got here. I played a little bit recently with Reuniclus, and this represents the closest I have ever gotten to completing the achievements. We actually completed a full beacon. Also is there a way to get the Diamonds for You achievement without actually needing another player? Because that's a resource I don't have much access to. Yeah, I tend to get bored sometime around the Enderdragon/Wither (yes, we actually defeated it, albeit on easy). What's amusing is that early on I'll feel like exploring and playing around in every biome, but once I settle down I tend to stay around there and look around the same cave systems. I'm most likely never going to get the "Adventuring Time" one, as it's an absolute pain in the rear; you have to visit nearly EVERY biome--and I mean every single biome, except like three--in the same world, and there's no checklist to help you. EDIT: Apparently, there is a checklist in the stats folder, and they've made it easier by not requiring the variant "M" biomes. I believe you can actually give them to zombies. Last edited by Cat333Pokémon; May 4, 2015 at 06:16:58 AM. Just the latest thing I've made. It's been over a month, so if this double post isn't necessary, I apologize right now. Anyway, this is a pic of me and my shiny Pokemon on the Pixelmon server I staff.